SCVHistory.com LW3415 | Saugus | Saugus Train Station Interiors & Exteriors in NBC's 'Supertrain' (1979). SPRR Saugus Depot in "Supertrain"
In the clip above, Steve Lawrence shows us the interior of the Southern Pacific Railroad's Saugus depot as it appeared at the end of its 91-year run as a working train station. Once inside, we first see the back wall of the agent's office, followed by a scene featuring Char Fontaine ("Love, American Style") in the room currently (2018) utilized as the Santa Clarita Valley Historical Society's museum. Note the original exterior colors of the depot — white with blue-green trim. Also note station agent James Guthrie's trailer attached to the back of the upstairs rooms as seen here. The Guthrie family lived on the second floor and added the trailer for a living room. The clip is from the pilot to "Supertrain," No. 22 on TV Guide's "50 worst TV shows of all time" list (as of 2002). It was one of the biggest flops in television history. Premiering February 7, 1979, it was said to be the most expensive TV series ever produced in the United States to that point. After all, nuclear-powered transcontinental bullet trains cost money! 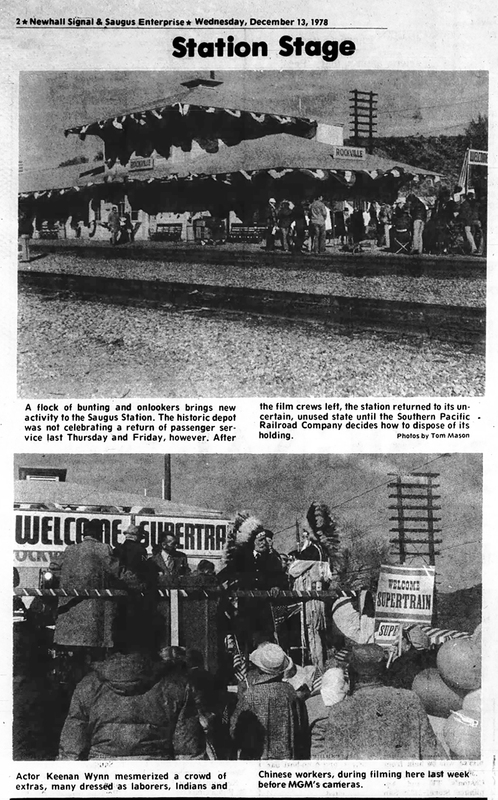 "Supertrain" was going to be NBC's answer to rival ABC's then-current "The Love Boat," with similar character development and a wide-bodied train in lieu of a Princess cruise ship as the stage. You remember "The Love Boat," right? You don't remember "Supertrain," right? 'Nuff said. It didn't work, despite a pilot "cast of thousands" that included Vicki Lawrence, George Hamilton, Stella Stevens and Keenan Wynn, and onboard amenities such as a disco nightclub, shopping mall, swimming pools and a gymnasium. NBC canceled it after just three months (9 episodes). In the pilot (titled "Express to Terror," with a mysterious assassin making repeated attempts on a particular passenger's life), the Supertrain pulls into the town of Rockville (Saugus) just three weeks after the real-life Saugus depot wrapped up its activities. Passenger service had ended in 1971; freight service ended and the depot was shuttered November 15, 1978. Location filming in Saugus took place December 7 and 8, 1978, so this loser of a TV show actually provides an important public service by "freezing in time" the final working layout of this train station. Two years later, thanks to a massive community fundraising effort led by Ruth Newhall, Cynthia Neal-Harris, Tom Mason (who shot the photos in The Signal clipping seen here) and other members of the SCV Historical Society, the depot was moved two miles south to the "Frew property" section of William S. Hart Park in Newhall where it would be repurposed as a museum, becoming the nucleus of Heritage Junction.